"The Rhaetian Railway in the Albula / Bernina Landscapes" consists of the Albula and Bernina transalpine railway lines, noted for their technical quality. The lines were built from 1908-1910. The Bernina line leads from St. Moritz to Tirano across the border in Italy. It was designed to follow an existing mountain road. After having visited Mustair, I drove across another mountain pass: the narrow and winding Albula pass. I wondered if it follows the same stretch as the railway line. I saw some tracks and stations, but none of the remarkable engineering works. I had to try riding a train on this railway of course. So I parked my car in Thusis, and bought a return ticket to St. Moritz. This covers the designated part of the Albula line. I travelled in the regular regional express train, which leaves every hour for the 1.5 hour stretch. The plus side of this train is that the windows can be opened, so you can get better photos. If you know what to take photos of, that is. I had printed the Albula part of the nomination dossier, and tried to follow the route on paper while I was on the train. But to be honest - the objects mentioned are difficult to see from the train. At first the only things I noticed were the numerous tunnels. One sits in the dark for almost half of the time! The icon of this line is the Landwasser Viaduct, and fortunately it was announced by the conductor when we were almost there. So I could get a good look at it and take some photos. The remaining technical highlights en route I found difficult to appreciate from the train. So I was a bit disappointed with the "experience" in general. Swiss Rail is known by many for its proverbial punctuality. Having travelled a bit by train in Switzerland, though, to me another feature is the most striking one: It's reach. Swiss trains climb most mountain chains to reach even small rural valleys and remote towns in the backwaters. Where in most countries trains and public transport in general are a travel option for the less affluent, Swiss Rail to this day seems to be the national mode of travel for all strata of society. Just check out how many Swiss own a GA (General Abonnement), a full year rail pass, costing 3800 CHF in 2nd class. In a country so infatuated with railways I think the inclusion of the single most iconic railway of the country is a worthwhile addition. I have to concur with previous reviewers' statements: It's a bit hard to appreciate the site from the train window. While you get nice views of the scenery, you don't see much of the engineering feats. However, you can hop on and off the train and hike from one station to another. There is yet another Swiss heritage trail running from Thussis to Tirano that you can join at any station. I only covered a small portion of it at Filisur but it included the famed Landwasser Viaduct. If you have some time (I didn't) I would probably hike from the Viaduct to Bergün where the Albula Train Museum is located. The museum is rather pricey (15 CHF) for a rather a small site, though. 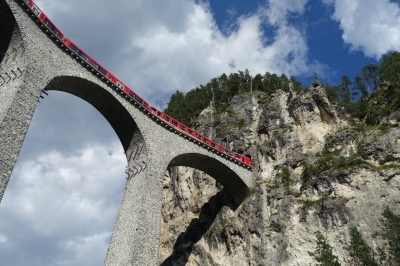 Most train aficionados will probably opt for the Bernina Express from Chur to Tirano via Sankt Moritz. This is also the most pricey option as you need to pay additional reservation and booking fees, also payable by holders of the Swiss Travel Pass. Alternatively, you can take the normal regional trains running the area. These seem to run every hour and are free for holders of the Swiss Travel Pass. The end point of the line in Italian is Tirano which connects you to the Milan Hotspot. From Sankt Moritz / Samaden you can go to Müstair. First take the train to Zernez and from there the bus to the abbey. From Müstair you can also head into the Dolomites. Via the capital of the region in Chur you can travel back to the Zürich Hotspot. 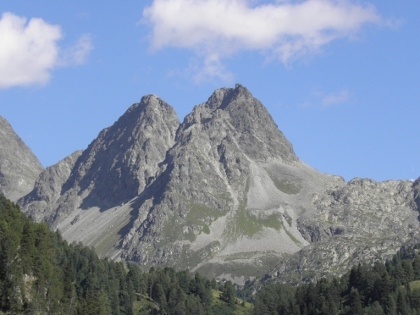 You also have access to the Swiss Tectonic Area Sardona via Flims. In Sept 2016 we spent a few hours driving the c125kms from Tirano to Thusis across the Bernina and Albula Passes, stopping along the way to see various aspects of the Rhaetian Railway. My general impression was that the Bernina section provided the better “scenery” and the Albula section the more interesting/accessible “railway engineering”. Overall the site passes through some fine, albeit “typical”, Alpine scenery and in some parts contains some interesting, even spectacular, (if not “unique”) railway engineering. Its boundaries, OUV, and even its title, also provide interesting examples of the subtleties and compromises involved in defining a “World Heritage Site”. I explore these below. For a few kms the line runs along the road itself. The Nomination File makes much of this “It is rare for European railways to run on roads through towns like the Bernina Railway does. Overseas, this kind of layout was once more common, but those stretches have since been rerouted or closed down”. But it is only after 13kms that you reach the first real sight of interest – the circular “Brusio Viaduct”. A few kms later the road and railway diverge, with the former entering the Bernina Tunnel whilst the road crosses the col with fine glacier views. It then drops to meet the railway which is still climbing to its highest point at Ospizio Bernina. For the next few kms road and rail follow the plateau from Lago Bianco through winter skiing country and there are fine views of the line and trains in “high mountain” scenery (Photo). Both then drop to the Upper Engadine valley. At this point by road there is no need to take the “dog leg” into and out of St Moritz, instead we cut off East along the valley straight towards the Albula Pass. As far as we could identify, it wasn’t possible to see much of the railway from the road on the southern side of the Albula. So the next stretch which is visible is from where the railway emerges on the Northern side from the Albula Tunnel at Preda. On the way down towards Thussis there are fine views of the railway entering/exiting tunnels and crossing viaducts from a surprising variety of directions - you see an approaching train in one direction and then it disappears and reappears in a completely different area, having gone through spiral tunnels and across viaducts! The 2007 AB evaluation recommended that “it would ….. be appropriate to consider the creation of an Interpretation & Documentation Centre of a quality commensurate with the outstanding universal value of the property”. The “pretty” alpine village of Bergün north of Preda and south of the famed Landwasser Viaduct must have been chosen for this job and a museum opened at its railway station in Jun 2012. With admission at 15CHF and us short of time, we didn’t bother, investing our time instead on walking to the Landwasser which is set around a kilometre back from the road. By then we were running out of inclination as well as time and felt that we had seen enough to “understand” what the Rhaetian had to offer! So - does that “offering” stand up as a WHS? The Nomination File states that “The National Geographic Traveler rates the Bernina Express as one of the ten most beautiful railway lines in the world.” I have been unable to verify this claim on the Web though there are many similar “top train” lists by various publications – some of which do include the Bernina among others (though usually within a European comparison) and some of which don’t. It certainly passes through some fine scenery but is this primarily “a railway with some Alpine scenery” or “Alpine scenery with a railway running through it” or an equal element of both? This environmental/landscape aspect gained traction though through one of the main “comparison” factors which was “Railway lines within their surrounding landscape” thus - “Comparison of the surrounding countryside (buffer zone) ….. focuses on the countrysides that surround the railway lines or in which the latter are embedded”. And surprise, surprise, it concluded that the Albula/Bernina was very strong in this respect - “The visual qualities of the cultural landscape seen from the Albula/Bernina railway and the view of the railway from the cultural landscape are therefore of significant importance for the property." So - we have an inscribed railway whose main “value” lies in its relationship with the cultural landscape through which it passes. That value operates in 2 directions - what it takes from the landscape and what it gives to it (including for instance the role it has played in the Landscape’s development – hotels, skiing, agriculture etc). All very good, and one would then expect to see that Cultural Landscape included within the Nomination – but this wasn’t the case!! a. A “Core Zone” defined simply as “The railway line with its structures, installations and systems” This is only 152ha in area across the lines entire Swiss length! 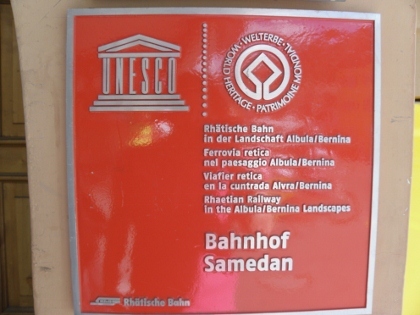 It appears that the site was originally nominated as “Rhaetian railway in the Albula/Bernina Cultural Landscape” - and that, at some time, and for some reason, all aspects of the Cultural Landscape were removed and placed in buffer zones. This must have occurred quite early in the process since the Nomination file is entirely structured around this fact. Despite supporting an inscription on this basis, ICOMOS didn’t like the idea of a site being inscribed using the words “Cultural Landscape” when its core zone didn’t include any of it! The suggestion was made therefore that “It would be desirable to change the name of the nominated property, in view of the choice finally made by the States Parties to remove the cultural landscapes from the nominated property itself and instead include them in the buffer zone. A more appropriate name would be Rhaetian Railway in the Albula/Bernina Landscape. This name refers to the remarkable natural landscapes through which the railway passes, and which are included in the "Distant Buffer Zone.” A “fine” distinction which I am not really sure addresses the problem! I visited this WHS in June 2014. After spending quite a lot of money to visit other Swiss WHS and mostly because on the day it wasn't sunny, I decided to visit the main train stations and scenic points of the Albula and Bernina passes by car. Considering the many tunnels involved, I think that this approach let me see much more than what I would have seen on the train and I could read the different information boards and take photos at leisure instead of seeing the sites for some split seconds on the Bernina Express. 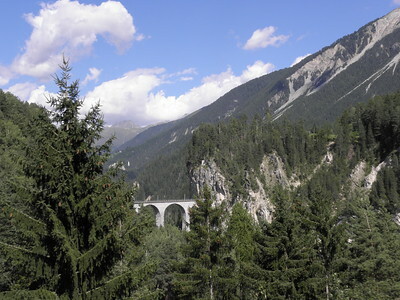 The main railway sights are Rothenbrunnen, the Solisviaduct, Pontresina, Morteratsch, Lago Bianco in Ospizio Bernina, Valposchiavo, the "round viaduct" of Brusio and the Landwasserviaduct. The latter was definitely my favourite and the true highlight of my road trip through mountain passes. From the Filisur train station, there's a short hike to a panoramic point over the Landwasserviaduct and a longer hike beneath it with a number of information boards along both ways. In the future I might be tempted to take the Glacier Express instead of the Bernina Express which costs around 100 euros for the return trip from Chur to Tirano. This is really a fantastic site not only for WH collectors, but for anyone who enjoys travelling by train and admiring scenic landscapes. After visiting the WH-listed convent at Müstair, I got on the Bernina line at Pontresina (from Müstair, take the bus to Zernez and continue by train) and took a southbound train to Tirano, just across the border in Italy. Tirano is quite a pretty town, with a famous pilgrimage church and the unique sight of a train passing right through the streets and squares. The next day, I took the same route back and continued until St. Moritz, where I changed into the Albula Train to Chur (the WH part only stretches to Thusis, but trains continue without the need to change). The lines were inscribed as a masterpiece of engineering, and rightly so. There is an endless line of bridges, tunnels, and viaducts, and the Bernina line is one of the steepest railway lines in the world, and one of the few that crosses the Alps not through a tunnel, but goes over a pass (at Ospizio Bernina, which is the highest point of the line at 2,250 metres). Technical features aside, the lines pass through a sequence of varied and beautiful landscapes (including a glacial lake that was still covered with ice in late May) and through German-, Romansh- and Italian-speaking regions, which makes for interesting linguistic diversity. Technically speaking, the Rhaetian Railway is a network covering all railway lines in the Canton of Grisons (the Swiss Federal Railways only go to Chur), and the Albula and Bernina lines are only 2 of them. 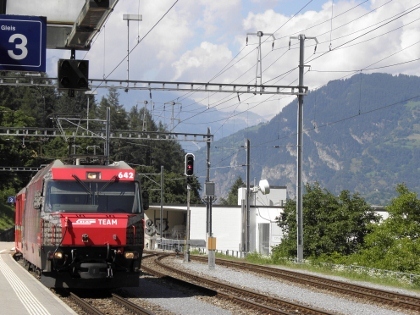 It should also be noted that there are hourly trains on both lines, and that the famous Trenino Rosso, or Bernina Express, only goes every second or third hour. In my opinion, it is not really necessary to take one, since it is more expensive, reservations are mandatory, and it seemed to be more crowded than the regular regional trains. 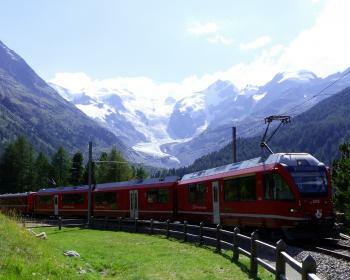 The major difference is that the Bernina Express cars are completely glass-covered, so the views are certainly better. However, you can see quite a lot on the standard trains as well. A highly recommended site. My journey from Milan to Chur took place on a perfect clear day. Starting out early from Milan Centrale the train skirted the east shore of Lake Como and then entered the terraced, vine clad Val Tellina which led to Tirano on the Swiss border. Here I left the Italian station and walked next door to the Swiss one. People were queueing here to take the expensive Bernina Express, but I took the empty regional train, better because it is cheaper and the windows open for taking photographs. After travelling through the streets of Tirano the train crossed the border and started the scenic climb around spirals, over bridges, through tunnels and across viaducts to reach the Bernina Pass. At this altitude the scenery was of mountains, glaciers, lakes, streams and a carpet of wild flowers. Descending to Thusis the line then levelled out and the Sardona peaks came into view as we approached Chur. 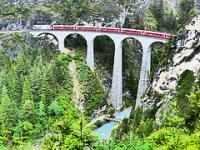 We started our journey from Davos so we missed the famous Landwasser viaduct near the town of Filisur. But there was still lots to see. Between Davos and Filisur the best views were at the Wiesen station. Between Filisur and Bergün the train passed many tunnels and when you're out of the tunnels you can watch the scenery of the valley. After Bergün the train comes to Albula viaduct. The rails make many spirals in the tunnels and you will lost coordination and wonder which side of the valley you will come out next. After Preda the train goes in to the long Albula tunnel. The train comes out of the tunnel in the village of Spinas and passes towns of Bever and Samedan and then comes in to the Bernina valley. At Morteratsch station you can see the Morteratsch glacier - if there is good weather and gladly we had that. After that train starts to climb to the Bernina Pass. At Ospizio Bernina station the railway is on its highest peak. Next to the station is the amazing blue Lago Bianco. After the train leaves the Lago Bianco behind you can see the magnificent view to Palü glacier. From Alp Grüm station is the perfect view to the glacier and to the Palü lake. The tunnels along the way made photographing hard! After many turns the train reaches the Poschiavo valley. Views from the slopes to the valley are once again amazing. The train passes town of Poschiavo which is famous for its three towers which you can see from the train. After Poschiavo in the village of Sant'Antonio the train turns to a tram and goes on the the road for a short period of time. 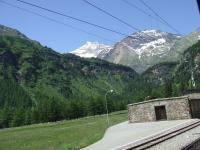 After Le Prese station train goes along the shores of beautiful Lago di Poschiavo and passes Miralago station. After that it reaches the village of Brusio and after the village the train goes to spiral of the Brusio viaduct. But we never reached this viaduct. Some other train had broken down near the Brusio station and all train traffic was cancelled. So we had to leave back to Davos and we never reached Italy and Tirano. Hydro Power Stations: Section 2b7 of the Nomination File is titled "Power for the Albula and Bernina line: the power station buildings along the railway line" Because of the site's "strange" use of different "levels" of "Buffer zones" (Primary Buffer Zone, Buffer Zone in "Near" area and Buffer Zone in "Distant" Area or "back drop") which actually contribute towards the OUV it is not possible to identify within the Nomination file exactly which zone the various power stations reside in!